Here we are on the eve of SXSW and I’ve seen several posts and comments across the social web from people with negative commentary on the conference. Strangely enough quite a bit of it coming from people that are still going despite the mudslinging. Really if it’s such a bad atmosphere then why even go? Many of these people make excuses stating they _have_ to be there despite their reluctance. It seems that last year sparked a “jump the shark” moment for the conference for many people. The conference has grown and in much the same way an indie band with a following gets dumped by many of their original fans upon penetrating the mainstream, many SXSW OG Geeks are now acting the same way. Sure I understand that last year the parties were overcrowded tons of people and most regulars felt overrun by the mainstreamers, douchebags, and the like, but SXSW is just a victim of its own success. This will be my 3rd year attending SXSW and I’m approaching it with just as much excitement as I have in previous years. Why? Because it provides me with the best opportunity to spend time with all the great people I’ve built relationships with online and discover new ones. My primary goal is to learn from these people, share knowledge, and have fun along the way. Also each year I’ve met many new great people that I’ve continued relationships with long after the show. Sure SXSW was much larger last year, but I adjusted. I didn’t go to as many parties and spend as much time at them either. The larger parties are usually so loud that you can’t really hold good conversations anyways which is my main goal. Each year SXSW becomes a proving ground for a startup to emerge as a one week beta test to emerge with a concept that is met with the crowd’s love and approval. The fact is this years’ conference anticipated attendance is much bigger than last year and will prove challenging. So how are the old timers responding? Well it appears that group texting has gained the buzz mindshare as being the breakout mobile app category this year. Why? Because as a preemptive strike people are creating small groups in these apps so that they can quickly communicate to organize meetups to avoid, or as a backup plan to overcrowded parties. I’m sure they’ll also be a good way to have an elite back-channel to the conference as well. 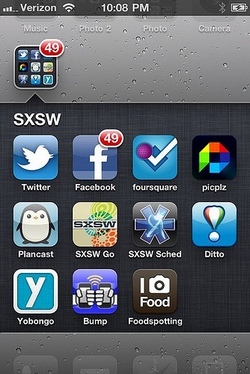 You can also read my post which details my experience at SXSW 2009 as a newbie here. Looking forward to hanging out again. Hit me up once you get into town. (http://rizzn.com/sxsw-2011/).